Dual enrollment is a concept that somewhat eluded me. It’s an opportunity for kids to take college courses while still in high school. Many states offer this program under a variety of names, such as Jumpstart, Concurrent Enrollment, Running Start, etc. I jumped at the opportunity to attend a seminar about dual enrollment at a local school. 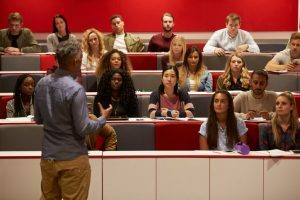 As a parent, I needed to know – Should I consider dual enrollment for my kids? For my clients, I wanted to provide information to help them decide. You Can Save Money – dual enrollment is a great way to save money on college tuition. Tuition and textbooks are paid for 100% through the program. With college tuition costing an average of $20,00 a year, dual enrollment can be a big help in reducing that amount. You could save an entire semester of tuition and fees. It’s Not for Everybody – just because the program can save you money doesn’t necessarily mean it’s right for your child. There are many other considerations such as maturity level, initiative, course load, scheduling, etc. There is so much to consider here; I will explore it further in a follow-up post. Varying Entrance Requirements – each university and technical college has different requirements to participate. Some differences include test score requirements, ages that can apply, semesters they can attend, and so on. You’ll want to research the requirements for the schools you want to consider. Most schools have dual enrollment requirements posted on their websites. Work with Your School Guidance Counselor – the high school guidance counselor is a great resource to provide insights on which schools to attend, to guide you through the application process, and to work with scheduling. What are your thoughts? Is dual enrollment something you are considering for your child? Do you know of students who have participated? What was it like for them? Post in the comments below. Watch for more of what I learned in upcoming posts.